Mamie Rearden reaches 114 on September 7 and her family held a gathering for her recently in Johnston. The following article, by a family member and one of The Advertiser correspondents Ethel Butler, tells of the occasion. 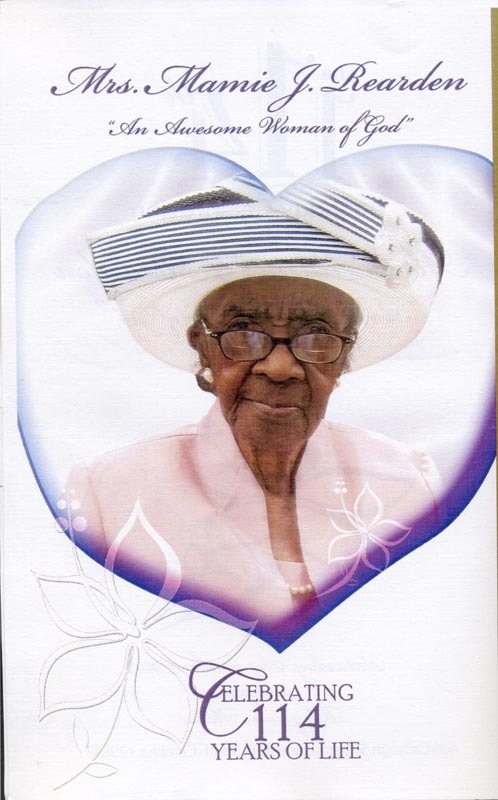 I had the special privilege of attending the 114th birthday celebration of my cousin, Mrs. Mamie J. Rearden, on Saturday, September 1, 2012. Her wonderful children had for her a spectacular celebration at Riley’s on Main in Johnston. Cousin Mamie was born September 7, 1898, as Mamie Julia Lewis, and grew up in the Pleasant Lane section of Edgefield County. She attended Log Creek Community School and is an alumna of Bettis Academy Junior College. She received her teaching certificate in 1918 and began teaching. She was married to Mr. Oacy Rearden for 59 years, and they had eleven children, ten are still living. Her husband passed away in 1979. She has attained so many accomplishments up to this present time in her life until it would take a very long time to tell it all. She received, among her many special birthday presentations, a message from S. C. Governor Nikki Haley presented by Mr. Harrison Rearden and a special birthday message from President and Mrs. Barack Obama presented to her by her daughter Atty. Sara B. Rearden from D.C.
Ms. Reardon and her family as they gathered to celebrate her 108th birthday. Presiding at her birthday celebration was Atty. Jacque Rearden, Esq., a granddaughter. Rev. Craig Myers, cousin Mamie’s pastor, from Springfield Baptist Church, prayed. Her daughter Mrs. Janie R. Osborne welcomed everyone and birthday greetings to his mother were done by son, Deacon James F. Rearden of Pennsylvania. There were many open birthday greetings to the birthday celebrity by her many relatives and friends. A son, Deacon George Rearden from Orangeburg, S.C., blessed the food. After a delicious meal and more greetings and snapshots, the highlight of the evening came when the birthday “celebrity” cut the cake. Everyone sang “Happy Birthday” to her. She was all smiles and mentioned she was enjoying the celebration. After a very special greeting to Mrs. Mamie Rearden by Rev. George Brightharp, there were remarks and closing by the Rev. J.C. Williams. 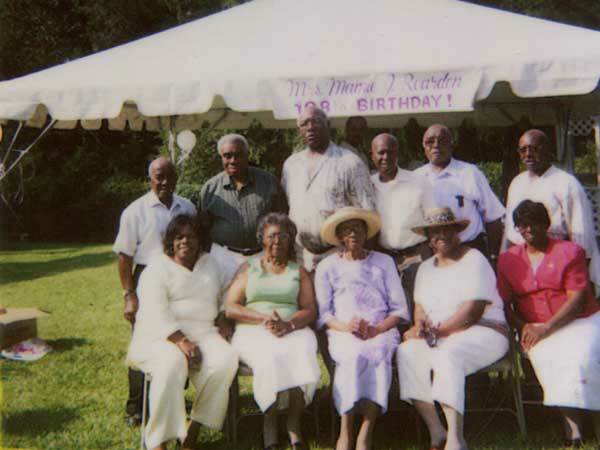 Special thanks to all was expressed by Mrs. Mamie J. Rearden and her family. We all received a souvenir; a glass trimmed in beautiful lettering with the message “A Phenomenal Woman and a Blessed Super Centenarian! Happy 114th Birthday Mamie J. Rearden September 2012.” It was indeed a most blessed occasion. Update: Ms. Rearden Passed away January 2, 2013. 2 Responses to "Mrs. Mamie J. Rearden, Age 114"